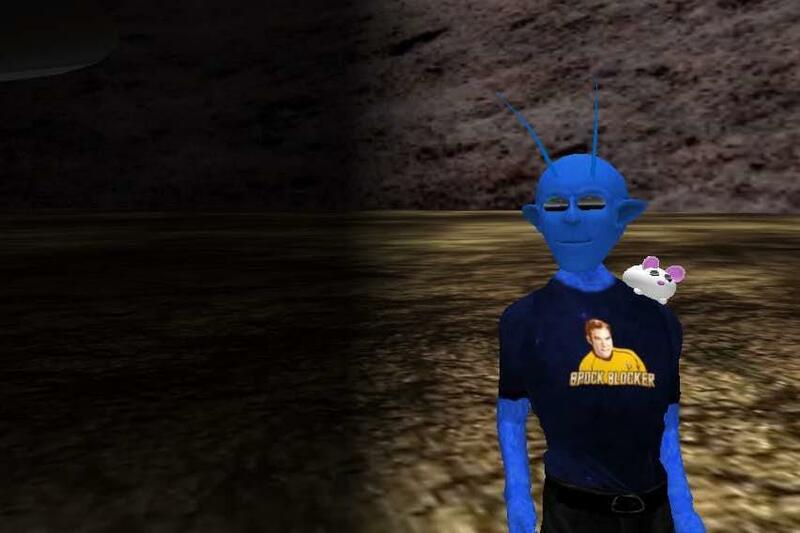 Visitor's Log - StarDate, Unknown: Cloned a poor blue alien on an unknown planet in the far upper reaches of Islandz Virtual World, I am still trying to make sense of these strange creatures of planet Ürth, known as "Hyoo-manz". I have thus far found myself rather worried by their apparently unexplainable madness. I've discovered that these Hyoo-manz worship colored bits of paper and shiny bits of metal with numbers on them and will do nearly anything for them, including kill each other, and any other life-form they believe will garner them a few more of these strange tokens. These bits of paper and metal seem more important to them than friends, family, or even life itself, and the safety of their planet hovers on the brink of annihilation at any given moment due to this strange lust for these odd bits of paper and metal. The animals of the planet don't appear to understand the Hyoo-manz any more than I do, although most Hyoo-manz don't seem to understand the animals all that well either. Because I'm not going to just freely give too much personal information to just any old random Internet "hacker" wannabe out there, we'll be limiting just how much we post here about my "real life" as a human meat-bag behind a keyboard, but for those who are interested, here's a little bit about me.